Double the waffles and double the taste with the BLACK+DECKER Double Flip Waffle Maker! Dual cooking plates let you make two waffles at once, while the classic rotate and cook system creates awesome texture and taste. Plus, the nonstick waffle plates have extra-deep grids to make room for all your favorite toppings. 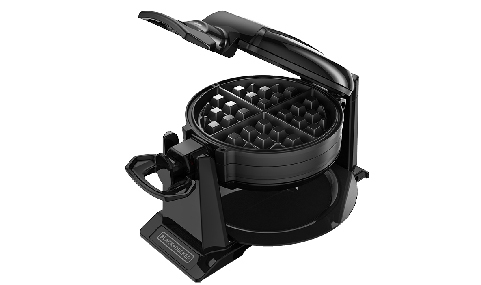 BLACK+DECKER just made tasty breakfasts a whole lot easier! Dual Cooking Plates- Two sets of double-sided waffle plates let you cook two delicious waffles at the same time. Rotate & Cook- The special cooking system lets gravity do the work to turn out ideal, airy waffles. Extra-Deep Grids- The nonstick grids turn out waffles with room for all your favorite toppings. Cool-Touch Handles- Keep the heat at a safe distance when rotating and opening the waffle plates. Handle Lock- A secure lock keeps the plates closed during cooking and rotating. Drip Tray- Keep your countertops clean with the drip tray that can be washed with a damp rag. Indicator Lights- Red when the unit is plugged in, green when it’s time to cook. Simple as that. Keep the heat at a safe distance when rotating and opening the waffle plates. The nonstick grids turn out waffles with room for all your favorite toppings. Keep your countertops clean with the drip tray that can be washed with a damp rag. The special cooking system lets gravity do the work to turn out ideal, airy waffles. Two sets of double-sided waffle plates let you cook two delicious waffles at the same time. Double Flip Waffle Maker is rated 4.8 out of 5 by 48. Rated 4 out of 5 by tmbart from Great waffles! I have been using this waffle maker for two months now. It is a great help with our family breakfasts. We love waffles and this one does a great job. Rated 5 out of 5 by annieday9909 from Fun Sunday mornings Fast and easy! I have used my new double flip waffle maker a handful of times now over the last couple months and i couldn't be anymore happy and pleased with how easy it is to make delicious waffles! I just pour in the batter and close it. In just a few moments we have perfectly cooked waffles! I really love how easy it is to cleanup afterwards and takes up a very small space in my cabinet. If you and your family love waffles this is the one for you, we love ours! 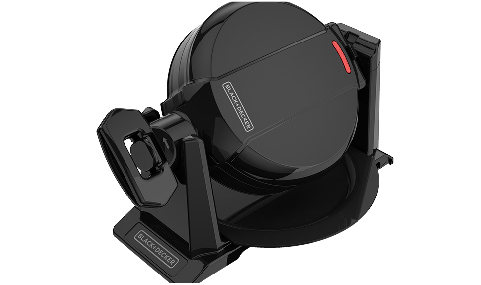 I am so happy and pleased to have had this opportunity to test and review black and decker's double flip waffle maker for free in the exchange for my honest and unbiased opinions and reviews. I know you will feel just as pleased as we are! Enjoy. Rated 5 out of 5 by jessgertken from Makes delicious waffles! I personally have never owned a waffle maker before. Due to the fact that I was never able to find one that was within my price range, and made good waffles. It is very easy to use this waffle maker and clean up is also a breeze. It makes the waffles crispy on the outside and fluffy on the inside. I also love that you can make two waffles at one time, and they both turn out great! With a brand like Black and Decker, you just can't go wrong! Rated 5 out of 5 by Kelleyj7177 from IN LOVE with this product! I love that it makes two waffles at once. Breakfast is done in half the time. Very sturdy, durable and easy to clean. I did a lot of shopping for the perfect waffle maker and this one IS DEFINITELY PERFECT. Doesn't bake waffles too fast or too slow. It does a great job and at a great price. Rated 5 out of 5 by Hollyhobbie6351 from Very Easy To Use! I have been so happy with this waffle maker it is so easy to use & love that you can make two waffles at one time. Rated 4 out of 5 by Anicole from Family loves using this to make waffles If you like making homemade waffles this waffle maker is a must have. I must say that you have to ensure you use a good batter and not overfill it. Also be sure to watch it so that the waffles cook to the desired coloring that you like but with a little practice it works well. I don't think it's overly bulky and it fits underneath my kitchen cabinet when not in use. This is another product where if you have not used it before you may need to practice a few times to get it right but once you do you will have delicious home made waffles at home. I like to use a semi thick batter so my waffles and thick and fluffy.